Ms. Claybelt was the fabrication of local businessman and creative genius Jerry Shepherdson. The Township of Dymond Council approached Mr. Shepherdson back in the early eighties, asking him if he could produce a larger than life-size cow as a tourist attraction for the area. "I'm always picking up challenges, so I said, ‘Of course I could'," answered Mr. Shepherdson. 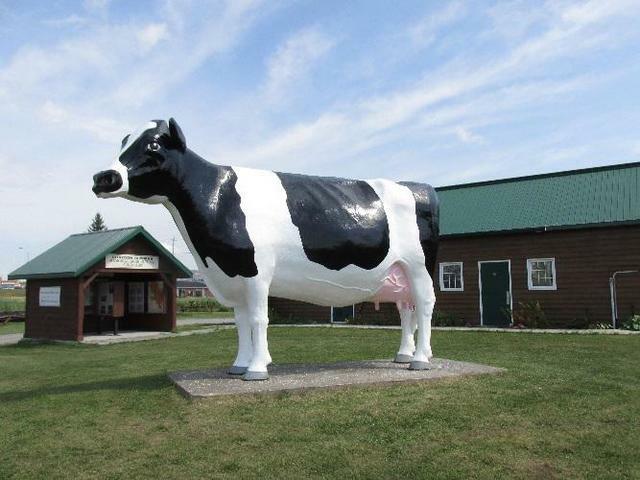 The Dairy Association of Canada brought a 12-inch-high by 18 inches wide statue of a Holstein-Friesian to Mr. Shepherdson and Ms. Claybelt was created from it. "We took the cow, set it on a piece of plywood and marked one-inch grids, we measured every inch. Then we just multiplied that by 12 inches," he stated. Ms. Claybelt has three by three square tubing running across her back horizontally and a steel frame down each side, as a base for her construction. Wooden ribs were then created to build her basic shape. "There were hollows that just wouldn't be accounted for with the design, as it was." "So then we took panels, one inch strips and we started to place them along, and pretty soon the form started." The Mid-Canada Fibreglass team then began adding fibreglass to the 12-foot-high Holstein. Altogether it took 865-man hours to assemble Ms. Claybelt, from start to finish. Mr. Shepherdson said they encountered a few minor setbacks during the building of the cow, starting with the head. "When we were making the head, the first attempt, it looked like elephant ears." At the end of construction, the crew faced another dilemma, not so easily rectified. "We made it inside the building, and the head was touching the ceiling. We got it made, it was kind of cramped. The ceiling was 12 feet high but the door was only 9 feet high." Face with reality that there was no way that the cow would make it through the doorway, the team searched for solutions, to no avail. "This is funny but I had a dream, I call then my visions. I take my work home with me I suppose," began Mr. Shepherdson. "In my dream I cut off the legs. I went into work the next morning, we cut the legs off, lowered it down and it went out the door. We got it outside the door, put the spigots in it again, stood it up right and took her over to the site." "I charged the township $10,700. I didn't make any money on it. My costs were about same." The Great Fire of 1922 was a wildfire burning through the Little Clay Belt in the Timiskaming District, Ontario, Canada, from October 4 to 5, 1922. It has been called one of the ten worst natural disasters in Canadian history. The preceding summer had been unusually hot and dry. Fire rangers anticipating the upcoming "burn" season, had requested to stay in the area but permission was not granted. They left at the end of the fire season in mid-September, leaving the area without fire protection services. In the fall when burning permits were no longer required, farmers and settlers started to set small brush fires to clear the land. But the dry conditions had persisted and on October 4, the wind turned into hurricane-force gales, fanning the flames out of control and combining the bush fires into one large inferno. Over two days, the fire consumed an area of 1,680 square kilometres (650 sq mi), affecting 18 townships in Ontario. It completely destroyed the communities of North Cobalt, Charlton, Thornloe, Heaslip, and numerous smaller settlements. In all 43 people died. One of the hardest hit towns was Haileybury, which burnt down within 3 to 6 hours. Thick smoke caused panic and confusion. The town's residents were forced to take refuge in the cold waters of Lake Temiskaming and cover themselves with wet blankets. The fire destroyed over 90% of the town, killing 11 residents, leaving 35,000 people homeless, and causing $2 million of damage. Ernie Fauvelle was born and raised in the Temiskaming Shores area of Northern Ontario, one of Canada's more important mining, lumbering and farming districts, and is now living in Haileybury, Ontario. His own experiences and the stories told by his father and other pioneers, have given a special realism to his art. He discovered the magic of clay in the early seventies and since then has been working full time in his studio creating his unique sculptures, original, one-of-a-kind pieces along with a successful line of Limited Edition pieces. He calls his work "narrative sculpture" and favour portrayals of those who work in mining, logging and the early settlers of the area. His work is in many private and corporate collections around the world. Climb Temagami's Fire Tower on Caribou Mountain…. a natural high! In August 1998 the newly restored Temagami Fire Tower was opened and dedicated to the Ministry of Natural Resources' Forest Rangers. The tower features two viewing platforms, one with a replica of the cupola on top of the tower, for those that don't like heights. There is also an Interpretive Centre located close to the parking lot which houses information about the Forest Rangers. The original tower was erected just a few metres to the east of the present site on Caribou Mountain in 1910. It was built of square timber design and was 45 feet high. In the late 1930s this tower was demolished and sent over the side of the cliff face in 1961. 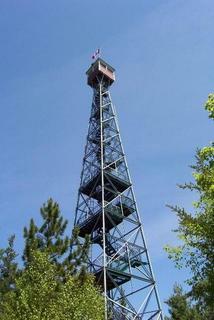 With the old 85-foot tower removed, a 100-foot-high steel tower was erected in the same year by seven Forest Rangers. There were nine towers in the area manned by Forest Rangers with field glasses, a detailed map and an alidade and azimuth, to pinpoint the exact location of a fire. The Temagami Fire Tower was last used 25 years ago to spot fire and for the past 47 years has been part of Temagami's skyline, greeting sunrise each morning. Climb the Temagami Tower for a breathtaking panoramic view such as the rangers would have seen. The 100-foot-high tower stands on the summit of Caribou Mountain, 400 feet above the town and 1300 feet above sea level. It is the highest point on Yonge Street, otherwise known as Highway 11. The cupola, at the top, commands a 360-degree view in excess of 40 kilometres. From the cupola the fire tower on top of Maple Mountain can be seen on a clear day. 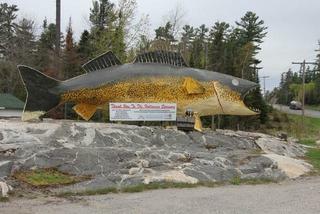 The Marten River Pickerel was originally constructed in the late 1960s. The group responsible was the Marten River Tourist Operators Association. Winter tourism was non-existent in the area at that time, therefore members decided to do a fun tourism project. Members of Tourist Operators (mostly women) had the time and liked the challenge of this daunting project. The prime goal was to have it completed in time to enter the winter carnival parade in both North Bay and Temagami. This was viewed as an opportunity to raise the profile of our small community that is located between the well-know fishing destinations of Lake Nipissing and Temagami. The prime movers were Roger Betz, president of the group, and his wife, Marylyn of Richfield Lodge, Ernie and Kathy Chretien of Ravenscroft Lodge, Bert and Simone King of Opeechee Camp, George and Mae Mennear of Timberlane Lodge, Terry and Mae Fisher of Marten River Lodge and Gil Seguin of Pozniak's Camp. The construction consisted of a wood frame covered and shaped by papier maché. Getting the latter dried was a real problem solved by the kind provision of the heated garage at Timberlane Lodge (service station). Many layers were required to achieve the desired shape and you can imagine the scramble to get enough paper to answer the needs from among our small community. Fortunately, there was a lot more volume to newspapers in those days. Kathy Chretien had the artistic talent and ability to transform our construction "Project" into a recognizable visage of a fish. She did a great job working her magic on its exterior! Initial goals were reached when awards for our "Float" were received at both winter carnivals. The long-range possibilities of the fish being available for many years didn't enter into the original planning scheme. However, its durability after being bounced around the countryside on a truck, plus the blood, sweat and tears shed in its creation encouraged the idea of exhibiting our pickerel for as long as possible. 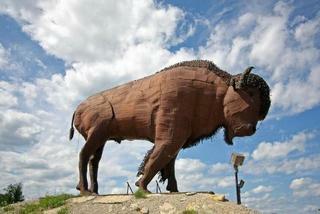 This all-steel welded sculpture of the North American Bison stands 19 ft (5.8 m) high and 27 ft (8,2 m) long. It weighs 9 tons. Mike Camp, the sculptor, worked over a year on this unique work of art (1983–1984). In June 1930, Carl Bush Thorne offered the community of Temiscaming two splendid works of art acquired in Florence in Italy, specifically, a fountain and a well. These collectors' pieces had formerly graced the courtyard of the home of an old aristocratic Roman family. His gift of these two works of art expressed Carl Busch Thorne's commitment toward the concept of a Garden City which figured prominently in the town planning. Almost 4 metres in height, the red marble fountain includes two water basins and is topped by a bronze statue of Neptune. The upper basin and the base of the fountain are encircled by mythological figures. 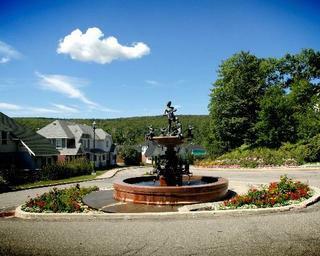 In 1986, the Town of Temiscaming initiated a complete restoration of the fountain. Carl Bush Thorne, a Norwegian engineer, arrived in Canada in 1903 to work for the Riordon Pulp & Paper Company. As Vice-president and Technical Director of Riordon, he supervised the construction of the pulp mill and the town of Temiscaming. Carl Bush Thorn's career with the company continued with Canadian International Paper, who purchased the mill and the town in 1925. 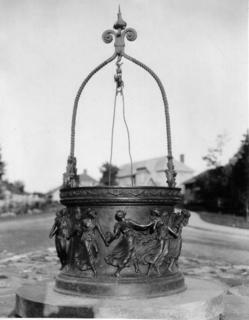 In June 1930, Carl Bush Thorne offered the community of Temiscaming two splendid decorative works of art acquired in Florence, Italy, specifically, a fountain and a well. These collectors' pieces had formerly graced the courtyard of the home of an old aristocratic Roman family. His gift of these two works expressed Carl Busch Throne's commitment toward the concept of Garden City which figured prominently in the town planning. 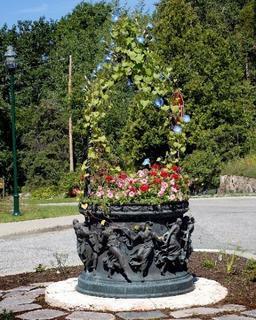 The outside of this decorative bronze well is adorned with figures of dancers. In 2001, the Temiscaming Lions placed a time capsule at the bottom of the well containing several objects and documents illustrating the life of the community. It will remain unopened until 2021, which will mark the 100th anniversary of the founding of the Town of Temiscaming.